Spice up your last-minute print projects for the holidays with these inspirational Thanksgiving Art, Posters and Graphic Design Idea's for Print. It's the Thanksgiving season, and people are starting to prepare their homes and their kitchens for a (hopefully) fancy dinner for their loved ones. Thanksgiving in itself is already a tradition, but in each family there is something to look forward to during this time of the year, maybe a specialty dish or a childhood home they only visit on Thanksgiving. You can feel the anticipation and the stress that might come along with it, but being able to spend this time with your family and friends is truly something to be grateful for. It's already hard juggling work and domestic obligations, what more to whip up an event to top it off? Unless your name is Martha Stewart, you need a miracle - or at least one week to completely prepare for your Thanksgiving party. Luckily, we have found some stuff that you can try on your own, more like last-minute print projects to spice up your home during the holidays. To adorn your home, you can take inspiration from 20 of these Thanksgiving print projects we've found throughout the Web. For the holidays many of the large printing companies have wonderful offers, be sure to check them out. Also if you haven't bought your turkey yet, you better have someone cook for you this coming Thanksgiving - what is Thanksgiving without turkey! 1. Food Drive poster by Edie Davis. Here's a poster design inspiration if you and your family and friends are planning to be a blessing to others this Thanksgiving. This is a simple poster design that would be a good fit to celebrate the holidays, sticking only with the details of the food drive event and using a food-inspired color palette. 2. Idlewild Co. Paper Products from Etsy. Idlewild Co. is an online shop owned and run by Katie Gastley, designer/painted from Vero Beach, Florida. Idlewild Co. creates beautiful printed arts, and this Give Thanks postcard from the store would surely look great as a table display or something to go along with your Thanksgiving giveaways. 3. Draw Together Thanksgiving Set printables from Caravan. Caravan is a go-to site for digital downloads and is run by graphic designers and illustrators. They sell digital prints for almost every occasion, and this coloring set is just one of their wonderful crafts. For this coming Thanksgiving, you can also check out other typographic printables they offer on their blog. 4. We Are Thankful For printable poster. Welcome your guests as they enter your home with this We Are Thankful For poster. Invite them to write down the things that they are thankful and add in your favorite quotes or verses as well. Design blog Confetti Sunshine offers this printable poster for download on her blog, and it's perfect for this coming Thanksgiving as a reminder of all the things that you and your family are grateful for. 5. Thanksgiving Typography Poster by JohnDoeHandmadeGoods. For the more design and typography-inclined, this one's for you. This Thanksgiving Typography Poster by Lindi Koprivnikar is on sale via Etsy under JohnDoeHandmadeGoods store. The poster would look good as a display, and it also pokes fun at the holiday rush during this season ("May you not get crushed by maniacial shoppers". 6. Give Thanks print by Ana Victoria Calderon from Etsy. Whether as a display or as gift, your guests will surely feel grateful to be celebrating this season with you. Ana Victoria Calderon sells this Give Thanks print via Etsy, and she also creates prints with inspirational quotes and designs for other occasions and as well. This Mexican/American designer is currently based in Mexico City but you can visit her online shop here for other items. 7. May The Pies Be Ever In Your Flavor poster by Eskimo Chateau via Etsy. This funny Hunger Games-inspired poster is best suited for your home, just in time for Thanksgiving dinner. More pumpkin pie, anyone? 8. Grateful guest board. Aside from your lovely dinner and you being a graceful host, why don't you invite your guests to write the things they are most grateful of? 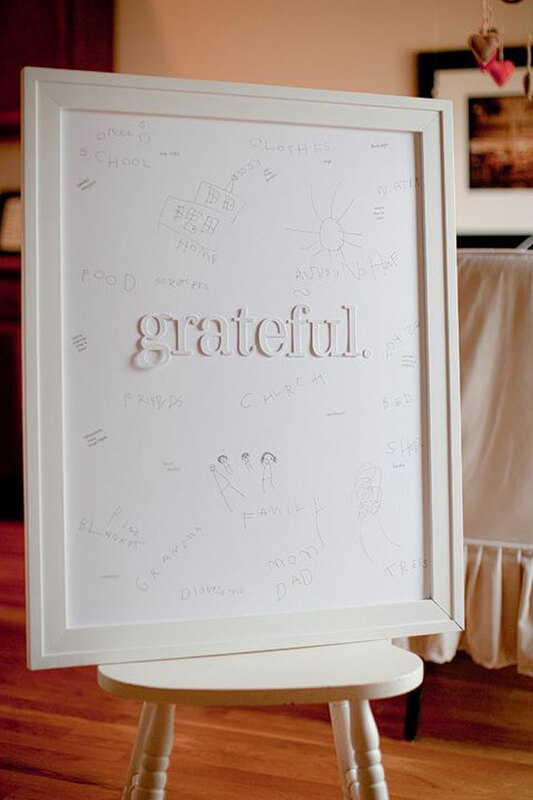 You can create something like this Grateful guest board: an easy DIY project to try this Thanksgiving. You can just print and cut out the letters using white paper and board (for a minimal look). 9. Give Thanks print by The Hipster Housewife from Etsy. Christine Errington is the person behind The Hipster Housewife, another Etsy shop that offers whimsical greeting cards and scriptures on print. Her Give Thanks postcard is a beautiful reminder of the things we should be grateful for during this holiday season. 10. Thanksgiving poster vector download. Nothing beats a customized art display: why not start with this vector download for your Thanksgiving poster? 12. Leftover pie label printables from Studio DIY. Show you love and appreciation to your guests with these pie labels they can take home. It makes giving out leftovers so much fun. Props to design blog Striped Cat Studio for coming up with these designs. 13. Give Thanks digital print by Tribe Design. Let the true star of Thanksgiving shine through: the turkey. 14. Thanksgiving Poster design by Petra Cuschieri. This Thanksgiving poster design was given a modern twist by Toronto-based graphic designer Petra Cuschieri. It gives a refreshing view away from the usual color palettes associated with this holiday and still looking so festive. 15. Thanksgiving flyer template. Full photographic image, bold typography and just a hint of vintage filter, this flyer template might just be what you need. 16. Printable pillow box. We got this printable pillow box template that you can use as a Thanksgiving dinner favor. Fill it with sweet treats or chocolate bites that your guests would surely love. You can check out Sarah Hearts' blog for instructions on how to download the template and execute this DIY party favor. 17. Thanksgiving themed utensil holder. For those who wants to go OC with the details of their Thanksgiving party, look no further. You can download these Thanksgiving-themed printables from Craftaholics Anonymous for free, including these utensil holders. 18. I Am Thankful For tags by Jones Design Company. Fill any space, item or gift with thees I Am Thankful For tags that you can download and print from Jones Design Company. Write down the things you are thankful for and display it around your home, or give out blank tags that your guests can fill out as well. 19. I Am Thankful For tags by Almost Makes Perfect. Here's a variation of the I Am Thankful for cards that you can display on your dining table or any space at home. You can download these thankful tags for free from Almost Makes Perfect blog. 20. Fall is Fabulous printable poster by Tomkat Studio. The preparation for the upcoming Thanksgiving dinner might be stressful and tiresome at times, but the point of this holiday is really to take a breather and spend the moment to just say thanks with the company of your loved ones. May this printable poster be a reminder of how fabulous Thanksgiving season is. You can get this from Tomkat Studio for free. Make sure you spend your Thanksgiving thoughtfully by letting your loved ones know how much you are grateful for them. A small gift or a card would do the trick. But nothing beats a message of thanks especially when it personally comes from you. Have a happy and turkey-filled Thanksgiving! How about you, what's your favorite Thanksgiving project you've tried so far? Share and comment below! We'd love to hear your thoughts. Freelance writer and editor since 2011. Major design enthusiast. Resident writer and trendhunter for Printingdeals.